Edinburgh centre Ben Cairns made his Scotland debut in the first Test loss to Argentina in June 2008 before playing a crucial part in the victory over the Pumas the following week. Cairns had already represented Scotland at all age-grade levels and 'A' level before making the step-up to full international level. He is the joint-leading try-scorer for the U21 side and has skippered both the U18 and U19 sides. Cairns has been singled out as one of the young Scotland backs that may be able to break their distressing lack of creativity in the long-term after some sharp displays at regional level for Edinburgh in both the Magners League and Heineken Cup. 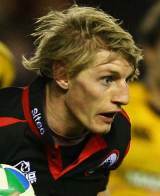 Cairns won further caps against New Zealand and South Africa during the 2008 autumn internationals before scoring his first Test try against Canada at Pittodrie. In January 2009 he was selected in Frank Hadden's squad for the 2009 Six Nations. Cairns made a solitary appearance in the tournament, at outside centre against Wales, and was to make only one other international appearance in 2009. His slide out of the international picture continued in 2010, although at club level he made his 100th appearance for Edinburgh and secured a new three-year deal. Despite missing out on the 2011 Six Nations, he was called up to Scotland's provisional World Cup squad In May.